Choices: The Most Important Strategy has been my theme this month. I've posted tips for learning to make appropriate choices at varied ages. Don't miss my tips for toddlers and for preschoolers! Students with special needs need to go through these steps, too, although often they need more support and can take longer at each step along the way. That is just their learning pattern. 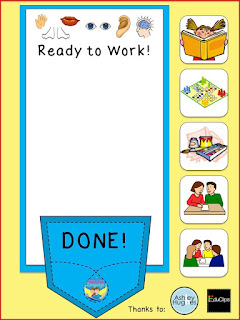 To help yourself out, find a way to snapshot what your child/student is like at intervals, whether it is parental journaling or the extensive record keeping of a special needs teacher or SLP. For parents, think about when you take videos. Usually when we do this, we are trying to catch our kids at their cutest! I’m talking about having some reminder of when they are at their worst. Maybe a family member who doesn't see your child daily will notice the change for you! Because when they are at their worst sometime in the future, that is when you will find support from seeing that they actually have made changes. When change happens incrementally, it is so hard to see and even harder to keep persevering! While our special needs kids also have to learn to make good choices, they can benefit from some additional supports along the way. Visuals! 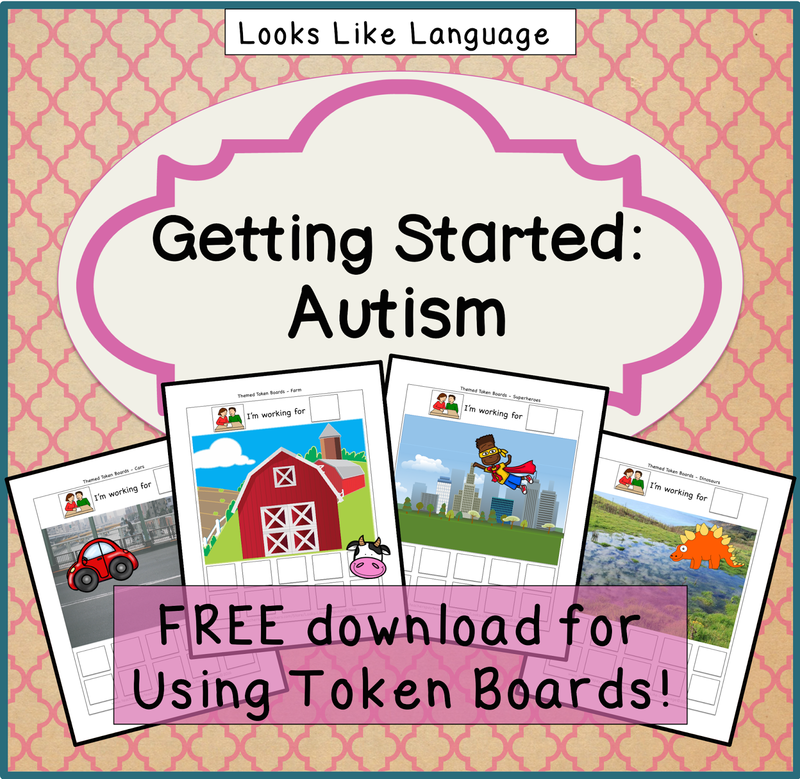 So many students with special needs, especially those with auditory processing problems and those who are on the spectrum, have so much difficulty with oral language. 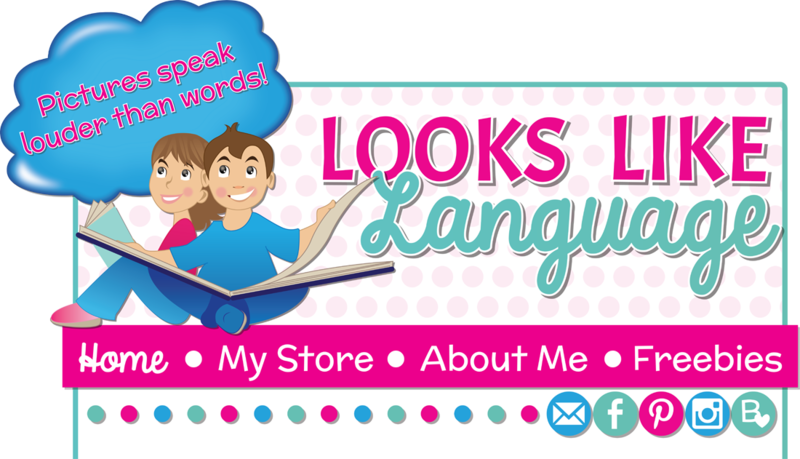 Pairing oral language with a visual support provides something with meaning to attach to the words, building comprehension skills whether your student speaks or is nonverbal. 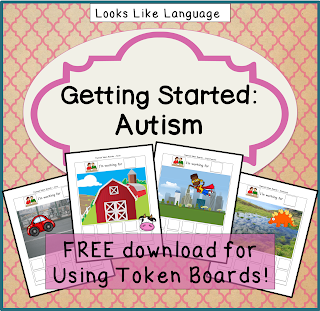 My free resource Getting Started with Autism Guide has been updated! Click here to get it! *Pair the words with the choice. *Say the name of the object the child is looking at. *Pause a second to see if the child will verbalize first, but don’t let the child get frustrated. For children who don’t vocalize often, pair a pictured symbol with the object. The easiest way is to cut the logo or photo from the box, place it in front of the objects and help the child point at it or hand it to you to make a request. 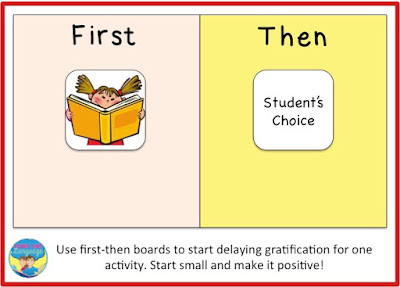 You determine the first activity that needs to be done, but the child gets to choose the follow-up activity. For students who are still learning picture representations, I have found it helpful to place the photo/symbol on the board anyway, with the real object next to it, out of reach, with a wait sign covering easy access to it. You may need to start with one trial before allowing access, building up from there, to let the child see the sequence and come to understand that he will get the desired object after the work is done. 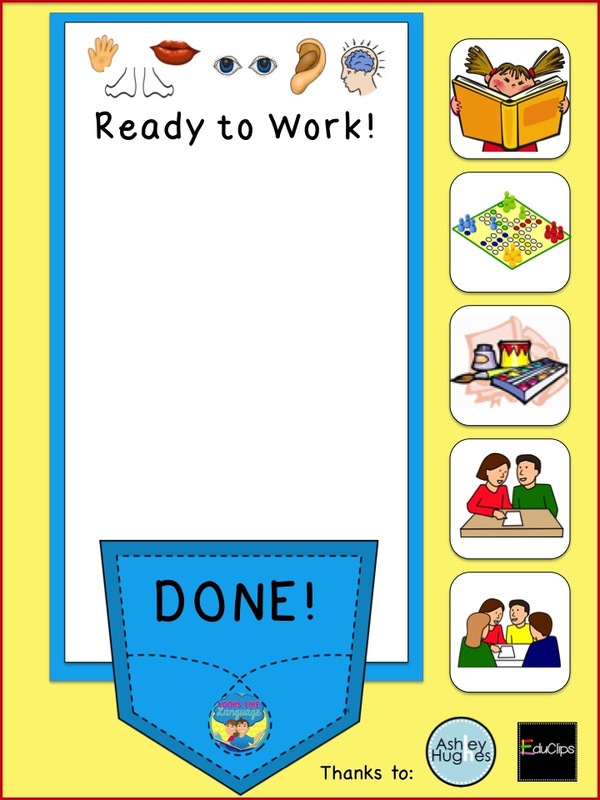 When the student understands choice boards and that events occur in a sequence, it is time for visual schedules. 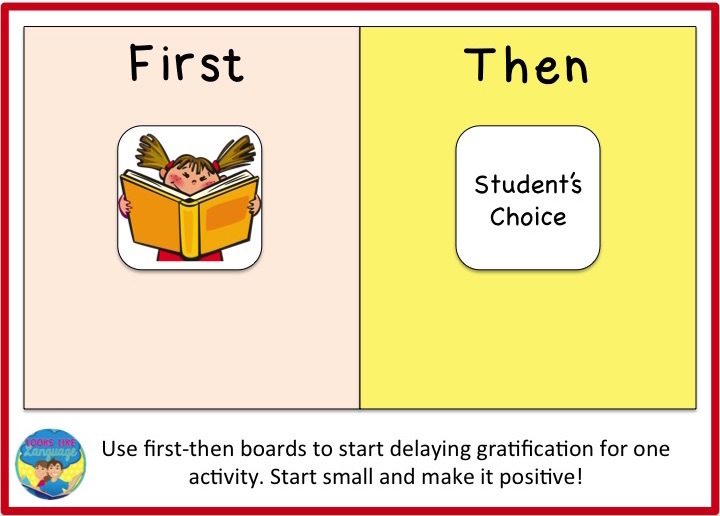 With a First-Then Board, the student has learned to work through one complete activity before getting a choice. You can lengthen the amount slowly by using a visual schedule, showing the sequence of events during a therapy session. I like to use symbols that show the type of activity since they can be re-used, like those in this picture. I included my ready-to-work attending cues on the top. I would say, "Your hands, feet and mouth need to be quiet so your eyes can look, your ears can listen and your brain can think!" After teaching this, my students often just needed a point cue at the pictures to remind them to get back on track. TIP: When an inappropriate choice is being made, try to keep your emotions out of the picture. Calmly point out the negative consequence of that choice and ask the student to reconsider their decision. Then give some time and space for thinking, letting it appear that they have come to a better decision independently. TIP: When the child makes a bad decision, try not to have the “I told you so!” attitude. Comments such as, “We all learn from our mistakes” can show understanding without assigning blame. It lets you follow up later, when emotions have calmed, with a discussion of how to make reparation and how a similar situation could be handled differently next time. TIP: When your student has an anxiety component, making choices can be incredibly stressful and lead to more problem behaviors, at times, than just expecting them to follow directions might. This doesn’t mean that we should not be teaching these students to make choices, just that we need to handle this important growing up skill with kid gloves and collaborate with our teams. Providing choices so that students can learn to make responsible choices is extremely important! Do you agree? Thanks to Educlips for the cute free chalkboards and to Ashley Hughes for the adorable free pockets!